We're tired of shoveling snow and aren't going anyplace this winter. So this is a good time to do some planning. 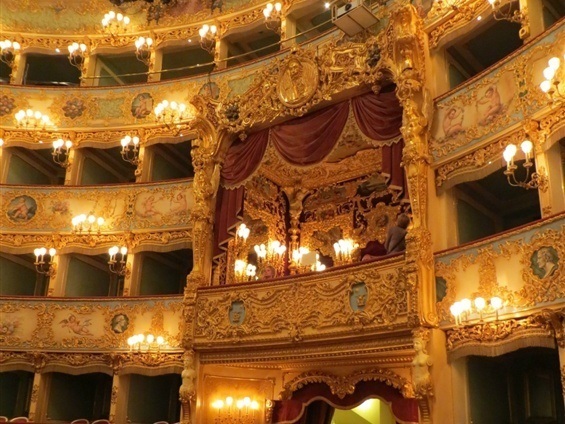 Here are a few tips for your trip to our favorite - Italy. If you're on the Grand Tour (and have a month or more) you can take in all of Italy's Big Three: Rome, Florence, Venice. Or you can pick and choose to match your inclinations (and your budget and time constraints). Rome is an enormous, sprawling place. It is, however, built on a human scale. There are no skyscrapers and none of the claustrophobic sense of New York. You can always see the sky and, from the right vantage points, the horizon. Since the street layout is haphazard at best and maddeningly chaotic at its worst, a good map is essential. Try something called "Streetwise" (www.amazon.com) They are laminated, fit in your pocket or purse easily. One side highlights historic sites, the other side art. 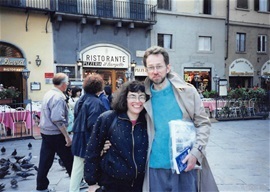 They are inexpensive and available for Florence, Venice and most major cities in the world. They will prove invaluable. Rome, despite its size, is a walking city. There are lots of tourist friendly signs and, with the map, you won't get lost. Likewise, Florence and Venice (both tiny by comparison) are easy to get around in on foot. Public transportation in Rome is pretty good. You won't need a car. Besides, driving in Rome is much, much worse than New York or Boston and there's no place to park. Walk. Walk a lot. You'll learn more about the city and you'll be too tired to try and do and see everything there is to do and see. 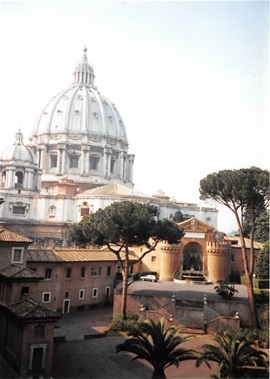 The sheer immensity and variety of Rome has overwhelmed tourists for centuries. One of the most famous (and useful) Italian phrases is "La dolce far niente" - the sweetness of doing nothing. The Italians seem to some to spend an inordinate amount of time in coffee shops and bars (which are frequently the same place) doing, well, nothing. This might be their greatest contribution to civilization. You're in Italy - exhale. It'll do you good. Please do not think of the trip as a contest to see how many sites you can check off. If you do, you'll be dazed and confused when you're there; exhausted and unsatisfied when you return. Of course, one does actually want to see some things. Many of the very best of those things can be found in the Vatican Museums. The long lines (very long, very slow) can to some degree be shortened if you go to the Vatican's website at www.vatican.va You can purchase advance tickets to the Museums and Gardens. The Vatican Gardens are especially beautiful. Groups are usually no more than 10 or 12 people and on a sunny day ... well, it is the Pope's backyard. Two of the most stunning works of art in the Western world are the Sistine Chapel and the Pieta. Access to the Pieta is easy. Just get in line to go into St. Peter's Basilica and it's on the right side just after you enter the main doors. Unfortunately, after the statue was attacked by a madman some decades ago, it's behind glass. There's always a crowd, so patience is required to edge up close for the best view. As for the Sistine and Michaelangelo's masterwork, viewing this may be a bit of a disappointment. First of all, the line is dreadfully long and tedious. Once inside the chapel itself one might expect a tone of, if not exactly reverence then at least silence. Instead there's always a low (or not so low) buzz from the visitors, interrupted by period announcements to be silent. Photography of any kind is prohibited and the guards are not shy about putting their hands over your lens should you lean back and try to take a picture of the ceiling. Photographing the ceiling seems frankly silly given its size and position. Just accept the fact that some things can't be transmuted into another form. But despite the long lines, the crowd or the guards, being in the presence of one of the greatest achievments in human history ... well, it's worth it. While your camera won't be of any use, a small pair of binoculars will provide an opportunity to see details(including the charcoal outlines of all the figures) that you otherwise will miss from the floor. The ceiling tells a unified story of the creation of man and much of the Old Testament history including a litany of the prophets and ancestors of Christ. That's a lot of territory, so it pays to study up a bit before you see it. Better yet, hire a guide. Tickets are free but unless you're a dignitary, diplomat or celebrating at least your 50th wedding anniversary, you're just thrown in with the masses and since seating is unreserved, you need to arrive at least 2 hours before things get started for a reasonably good seat. Even then you may find yourself behind a group of flag waving pilgrims who block your view. Or you could go to Piazza S. Pietro for the noon Sunday appearance of the Pope. No tickets required. Smaller crowds. The view is unobstructed but the Pope is about a mile away when he appears at his apartment window. He waves, gives a brief sermon and benediction. Rome is not Disneyland for Catholics. While many churches contain great art treasures, they are not museums. All of the churches are sacred places of worship. Visitors are expected to act and dress accordingly. Women with shorts and/or sleeveless shirts will not be admitted. 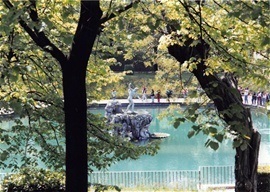 Certainly the greenest neighborhood in Rome is found at the top of the Via Veneto, in and around the Borghese Gardens. It's perfect for strolling. You get a great view of the city from the Pincio. It's best in the evening when all of Rome goes for a stroll. The Spanish Steps is the place for people watching. This area is one of the best (and most expensive) shopping districts in the world. Perfect if you're in the market for a $2,000 pair of shoes or a designer gown. If you're not a Saudi prince or a Russian oligarch, it has world class window shopping for free. While you're in the neighborhood, have lunch at our favorite place, La Rampa (www.allarampa.it ). It's the quintessential Roman place. The menu is extensive. The ravioli is especially delicious. Cindy lives for the tiramisu. Bring cash. They don't take credit cards. Food is taken very seriously. Service is an honored profession. Waiters (largely men) do not call you "you guys". They do not act as if they are auditioning to be your "friend". They are not between jobs. This is what they do. Their father was a waiter. There uncle was a waiter. Treat them accordingly and you will have the rare satisfaction of seeing work turned into high art. Tips are usually inclulded (servicio incluso) in the check (il conto). Two things you will not find in Italian eateries: ice water and butter (butter, sometimes in the North). Don't ask for them. It would be easier on everyone if you just wore a sign that said, "I'm an American tourist." No Italian drinks cappucino after noon. If it's no longer breakfast time and you need coffe - it's espresso. Anyway, who wants to be up all night? Italians are not much for late night entertainment. Usually it's just diner, go home, go to bed. So, pass on the coffe and finish the meal with a digestivo. Vin Santo or limoncello. Either one will do nicely. Skip desert. Go for a walk after diner and find a gelateria or a bibete cart. 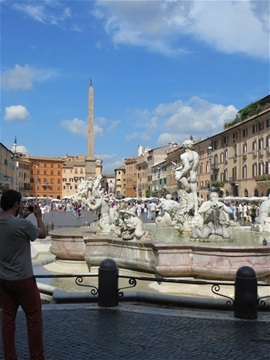 Perhaps our favorite place in Rome is Piazza Navona. Rome's most interesting public space, capped by Bernini's masterpiece, The Fountain of Four Rivers and ringed by shops, restaurants (the best of which is Tre Scalini (www.trescalini.it ) and gelateria. Not too far from the Piazza is another wonderful restaurant, Orso 80 (via del Orso 33) (www.orso80.it) . Just off the Piazza is San Luigi dei Francesi. This otherwise nondescript church houses three of Caravaggio's greatest works. Caravaggio is one of the 16th century's greatest artists. He was wildly notorious in his day as a duelist and fled Rome, escaping to Sicily, after having killed a man. Given their setting, you can view these paintings without the usual museum crowds. But bring a few coins. Like most churches that house works of art, those works are only illuminated only if you drop a coin into the box. Trevi Fountain. Very beautiful, very romantic and very, very crowded (day and night). Popularized (as if it needed more publicity) by the 50's movie "Three Coins In The Fountain" (rent it before you go to Rome) it is still worth the visit despite the crowds and the hordes of street vendors selling faded roses or some sort of flashing/bouncing gee-gaw. Throw a coin over your shoulder into the fountain to insure your return to Rome. 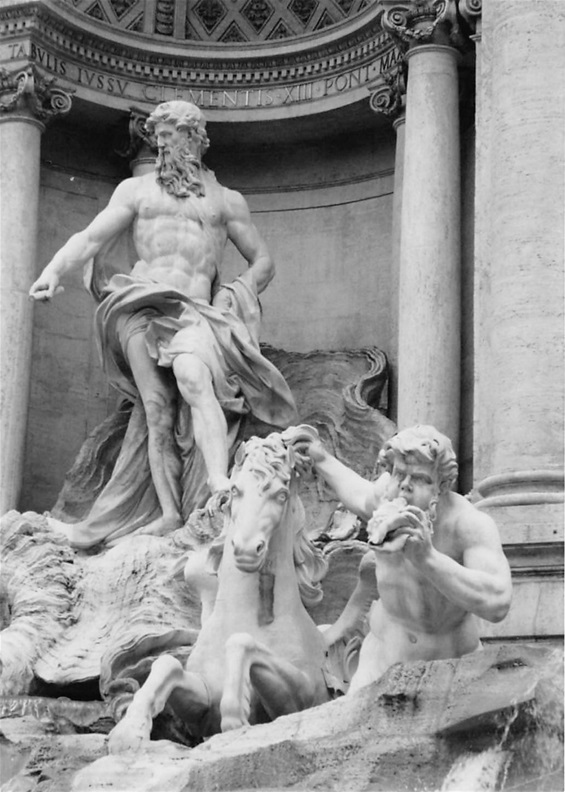 And no, the statute in the middle of the fountain is NOT Neptune. It's Oceanus (god of the underground river that circles the earth - source of all water). To his right is "Abundance" (note the horn of plenty at her side). To his left is "Health". Oceanus is riding a chariot pulled by two horses - one calm, one highly agitated - representing the various states of the oceans. Trevi is fairly close to the Spanish Steps, so if you're in the neighborhood of either one, go see the other. Pantheon. 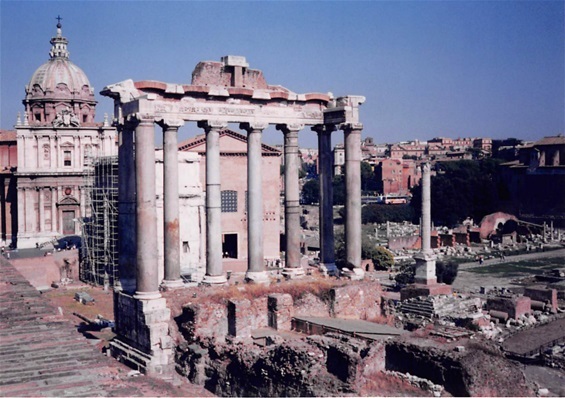 Along with the Coliseum, this is one of the few remaining structures from the days of ancient Rome. Santa Maria Sopra Minerva (with Bernini's unusual elephant in front) one of Rome's most beautiful churches, is nearby as is Piazza Navona. Trastevere. A relatively untouristy neighborhood on the same side of the Tiber as the Vatican is filled with good restaurants. The center of things is Santa Maria In Trastevere, home of the most dazzling mosaics in Rome. 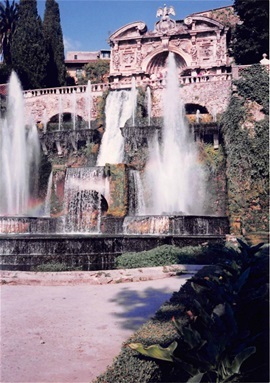 The principal day trip from Rome is to Tivoli and the gardens/fountains of the Villa d'Este. It's not hard to reach Tivoli by train (maybe an hour) and if it's too hot, sticky and crowded in Rome, the fountains of Villa d'Este are just the remedy. Expect to spend most of the day. Florence (Firenze to the Italians) retains much of its Renaissance look. Much of the historic district is traffic-free (or at least car-free). Nevertheless ALWAYS watch out for motorcycles and bicycles when you step into the street and ALWAYS look both ways. 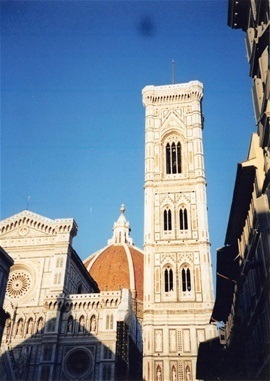 The heart of the city is the Duomo, Santa Maria del Fiore. Inside the Duomo, adorning the dome itself is Vasari's "The Last Judgement". Vasari (late 16th century) if he is remembered at all , is largely known for his monumental series of biographies of Italian artists ("The Lives of Artists). However, his work stands as a great masterpiece. It was renovated about 20 years ago and looks as brilliant today as it did when it was completed in 1574. The Baptistry. Like many church sites in Italy, the footprint consists of three separate buildings - the church itself, the campanile (bell tower) and the baptistry (since the unbaptised couldn't come into the church they had to be baptised outside first). The baptistry is home to the "Gates of Paradise: (1401) the bronze doors created by Ghibert, considered to be the first works of the Renaissance. The ones on the doors of the baptistry are copies. The originals are in the Museo dell'Opera del Duomo (across the way from the Duomo). 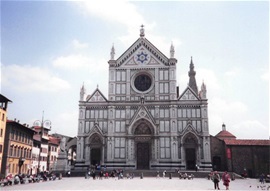 Although every neighborhood in Florence believes their particular church is the most important in the city, second on the list is Santa Croce, last resting place of Michelangelo, Galileo and Machiavelli. Ponte Vecchio. Built in 1345, it was the only Florentine bridge to survive WWII. Today it is largely filled with jewelry stores. Uffizi Museum. One of the world's great collections of art. You can avoid the lines and arrange for tours at www.uffizi.com . The tickets are date and time specific (with or without a tour). This is probably the best way to go. At the same site you can make arrangements for other museums (although after the Uffizi you may suffer from Museum Fatigue). Take a break and get some fresh air at the Boboli Gardens. The Boboli are at the edge of town and require some effort to reach. If you want to go on a picnic, go to the Mercato Centrale - a cast-iron and glass temple to fresh produce, meats, cheeses, breads and olive oils. 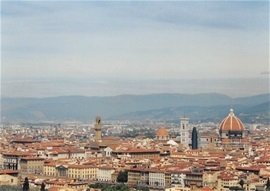 For a magnificent overview of Florence, take a cab up to the Piazzale Michelangelo. Don't forget your camera. You can also see a copy of Michaelangelo's "David". For the real thing, go to the Accademia (www.accademia.org ). Seen enough old paintings and statues? Me too. In that case, go to the Piazza della Signoria, find a table in the sun, order lunch and while away the day. The Piazza has been the civic center of Florence since the 14th century. It is dominated by the Palazzo Vecchio, Florence's town hall since its completion in 1322. Over the centuries the Piazza has served as an outdoor art gallery (the "David" currently in front of the Palazzo Vecchio is yet another copy, although the original stood on that spot until 1873) and promenade for Florentines and tourists alike. It also marks the site of the execution of Savonarola, the Dominican priest who came to his end at the stake in 1498 for suggesting to the Church and the ruling Medici's that they both were in need of serious reform. Food and wine in Tuscany are on a somewhat more elevated plain than in Rome (and that's saying a lot). It's also a lot meatier - crowned by bistecca all Fiorentina(an enormous grilled steak). Don't be afraid to try some cinghiale - wild boar. It's served in various forms but principally as salami or ground in a ragu sauce. It's exceedingly rich and more than a bit gamey. Wash it down with a bottle of brunello or chianti. You'll be fine. There's lots more on Venice farther down the menu, so I'll just add a few notes. By all means, ride on a gondola. Not to do so would be like going to Paris and not seeing the Eiffel Tower. Early evening is best. 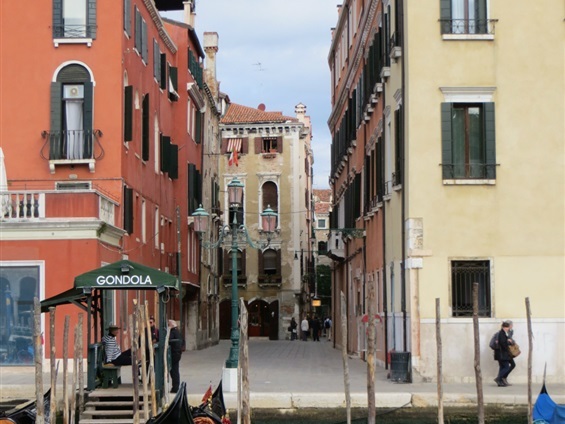 There are lots of different places to start out from but no matter where you begin you will almost certainly have to cross the Grand Canal. You'll spend most of your time on the less traveled side canals but during the day the Grand Canal is busy with commercial traffic and it can be kind of rocky , so later in the day when the traffic dies down is easier. It's expensive (100 Euros+). Negotiate. Go no matter the price. Beyond the Palazzo Ducale (immediately next to San Marco) one other "palace" is plenty. Ca'Rezzonico is fairly representative. Likewise Ca' d'Oro. Venice is tiny and easy to navigate. 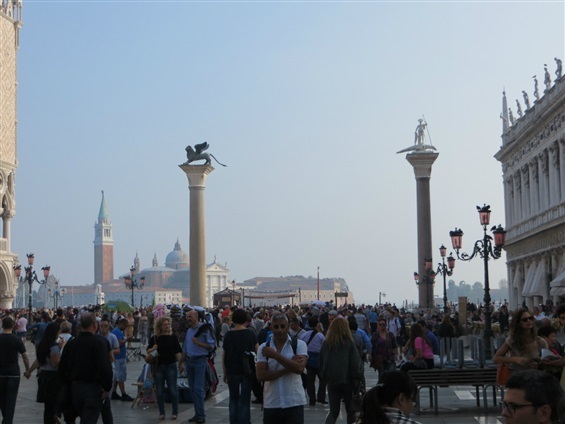 Don't spend all your time in Piazza San Marco. Go for a walk. Get lost. You can't get too lost - it is an island afterall. You'll find something of interest and you'll get away from the crowds. 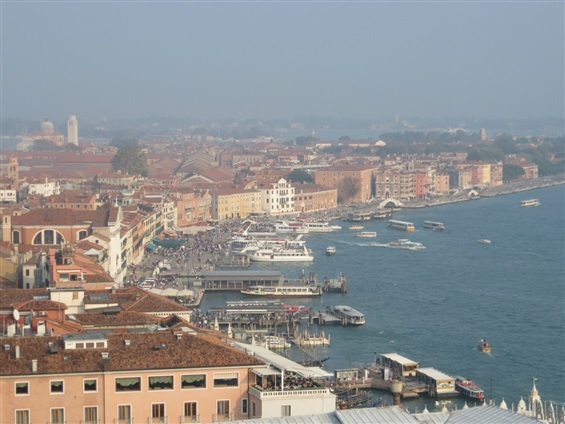 The Dorsoduro (across the Accademia bridge) is a good neighborhood for exploring as is Cannaregio. 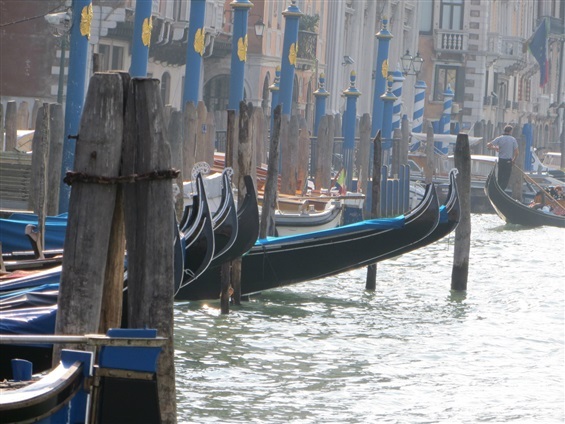 The outer islands - Murano, Burano, Torcello. We didn't get a chance to go to any of them, so I can't really say. I don't feel bad that I didn't go. Murano, of course, is all things glass. Including the obligatory pitch to buy something after you've seen the glass-blowing demonstration. Burano is (or once was) lace and the rainbow colored houses. If you've seen Katherine Hepburn and Rozanno Brazzi in the 1950's movie "Summertime" you know what I mean. If not, you should see it before you go to Venice. Torcello is virtually uninhabited but its church, I understand, has some lovely mosaics. A trip to any of the islands will take up most of the day (the boat ride each way is about an hour). There is a palpable magic to Venice. 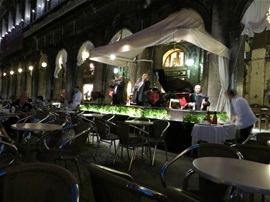 Some night, if it's warm and the moon is out, go to Piazza San Marco to the Caffe Florian. Sit under the stars. Have a bellini. Slip the band leader 10 euros for your favorite song. Sit back. Life doesn't offer much better than this. Contemplating a trip to Italia? For an insightful look at Italy, its people and the traditions that bind them together, wonderfully written by an American ex-patriot living in Parma, read "The Other Side of The Tiber", by Wallis Wilde-Menozzi. Ivan and I talk about going to Italy one day, you two will have to be our guides!! Beautiful pictures and wonderful writing. Lots of great suggestions and photos. We'll be in both Venice and Rome in late spring. Good advice! thanks! Love the site! We printed it and used this as a guide during our time in Venice and Rome. Thanks for all the advice!